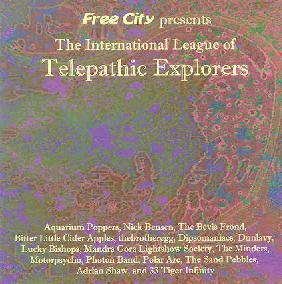 Various Artists - "The International League Of Telepathic Explorers"
Listening to The International League of Telepathic Explorers, you might get the feeling that you were tuning into a compilation of great, lost psychedelic nuggets from the 1960's. But two things give it away: one is the high quality production values, the other is the list of artists, which include familiar names from the present, like Adrian Shaw, The Bevis Frond, and Mandra Gora Lightshow Society, but also many talented lesser known artists. The people at the excellent psychedelic webzine and label Free City Media have put this CD together as a benefit for their ongoing project. So not only do you get to help them out by purchasing it, but you get a thoroughly solid collection of some of the best independent psychedelic artists going these days. And all the songs on here are either original tunes recorded for this album, or hard to find tracks from out of print releases. So you can't really go wrong at all. Kicking things off on this great disc is Magic Luxury from Norway's Aquarium Poppers, a tasty little psychedelic pop tune influenced by the likes of the Beatles and the Beach Boys. Free City Media's own Nick Bensen gives us Never Coming Down, a dreamy spaceout reminiscent of early Pink Floyd, which drifts slowly into a Middle Eastern guitar break before sliding back into dreaminess again. Lots of cool lyrical imagery too! The Bevis Frond's Being You sounds like a lost Neil Young rocker, but with Nick Saloman's distinctive vocals instead of Neil Young's distinctive vocals. England's Bitter Little Cider Apples give us a chunky little melodic rock tune called Crocodile Head, that has a bit of a new wave twist to it-sort of like the late 60's meets the early 80's-and it works! From the US, thebrotheregg offers up Mercury Retrograde, a mellow psychedelic pop song with eccentric vocals-a great tune with "Fool on the Hill"-like flute flourishes. How to Fall from Norway's Dipsomaniacs is a darker, folksy tune with many freaky moments. Dunlavy gives us The Guest, a mellow, spacey excursion with cool slide guitar, deep, hypnotic vocals, and creative harmonies. We are blessed with two tunes from England's Lucky Bishops, the colourful and quirky pop of Silent Car, and the weird instrumental Animal Kingdom, a fusion of 60's lounge music with frenetic rock n' roll rhythms. Of course there's Germany's Mandra Gora Lightshow Society, checking in with a fiery Doors-like freakout called Horse-race on a Roller Coaster, featuring some great organ. The Minders play Someday Soon, a summery acoustically inclined tune with great vocals. Another band from Norway, Motorpsycho, gives us the unlikely (considering their name and country of origin) bright, melodic sunshine pop of Go to California. The U.S.'s Photon Band offers up some delicious 60's sounding rock n' roll with stuttering guitar feedback on Magic Lantern (Triviality). Polar Arc, a mysterious artist hailing from some remote location in Alaska contributes the weird, eccentric, and folksy tune The Bride of Completion. Australia's The Sand Pebbles perform My Sensation, a soulful number that sounds a little like Prince during his paisley period. Former Crazy World of Arthur Brown, Atomic Rooster, and Hawkwind bassist and current Bevis Frond player Adrian Shaw chips in with a remix of Symbiosis (originally from his Headcleaner album). It's a soaring slice of space rock, with some wicked electric violin courtesy of Simon House. Finishing things off is another band off Free City Media's own label, 33 Tiger Infinity, who check in with Everything is Everything, a fuzzed-out, blisteringly distorted freakout that still manages to end on a soft and quiet note. Now if those descriptions don't sell you on The International League of Telepathic Explorers, you're just not a fan of psychedelic music! So when's Telepathic Explorers II coming out? Note that this is also a fantastic web zine with lots of profiles and interviews of various psychedelic bands.